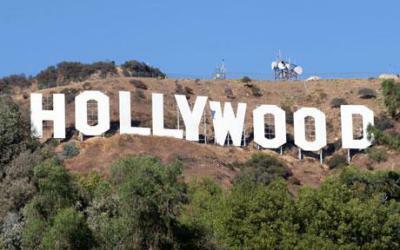 Hollywood, which by now represented not just a city, but also an industry, a lifestyle and, increasingly, an aspiration, was officially crowned when the “Hollywoodland” sign was erected in 1923. 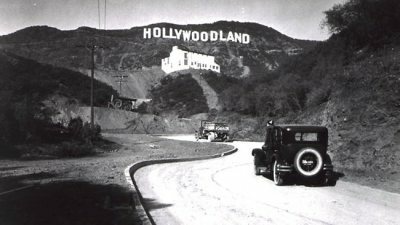 Built by Los Angeles Times publisher Harry Chandler as an epic $21,000 billboard for his upscale Hollywoodland real estate development, the Sign soon took on the role of the giant marquee for a city that was constantly announcing its gala premiere. Dates and debates swirl about when the Hollywoodland Real Estate development – and the massive electric sign that advertised it – came into being. But a review of local newspapers from the era (i.e., The Los Angeles Times, Holly Leaves, Los Angeles Record, Los Angeles Examiner and the Hollywood Daily Citizen) clears up any confusion. 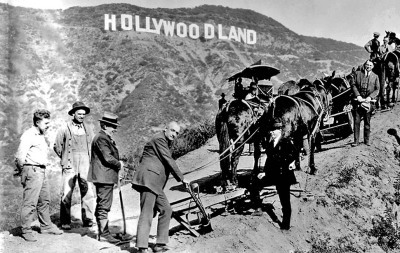 For instance, a Hollywoodland ad in the Los Angeles Times (June 10, 1923) states that the real estate development launched in late March of that year and that by June, 200 men were employed, 7 miles of road had been cut, and 300,000 cubic yards of dirt had been moved. Confusion solved: by the end of 1923, the Hollywood Sign was fully erected, a high-profile beacon – lights ablaze – for the fast-growing Los Angeles metropolis. The “billboard” was massive. Each of the original 13 letters was 30 feet wide and approximately 43 feet tall, constructed of 3×9′ metal squares rigged together by an intricate frame of scaffolding, pipes, wires and telephone poles. All of this material had to be dragged up precipitous Mt. Lee by laborers on simple dirt paths. Few know that a giant white dot (35 feet in diameter, with 20-watt lights on the perimeter) was constructed below the Sign to catch the eye. The Sign itself featured 4,000 20-watt bulbs, spaced 8 inches apart. 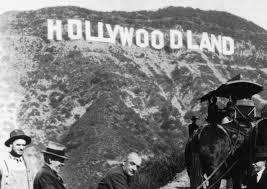 At night the Sign blinked into the Hollywood night: first “Holly” then “wood” and finally “land,” punctuated by a giant period. The effect was truly spectacular, particularly for pre-Vegas sensibilities. Originally intended to last just a year and a half, the Sign has endured more than eight decades – and is still going strong.